It's more fun to look than relax in this Provincetown property. 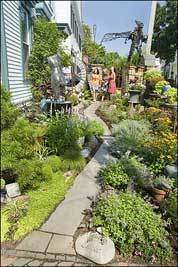 BUSINESSMAN RONNY HAZEL LOVES listening to people's reactions as they walk by his art-filled Provincetown garden. On some days, as many as 20 visitors may be gathered out front, craning their necks to get a look at his collection. "All you hear are people saying, 'Oh, look at that, honey! Oh, did you see that?' Not just one voice, like 10 voices," the shop owner says. "It's so cool. You just want to tape it." After admiring the Victorian for years, Hazel purchased the mansard-roof fixer-upper in 1990. At first he focused on making the long-abandoned guesthouse livable; the garden was an afterthought. When he moved in, "20 years of garbage and an overgrown hedge" surrounded the home, and the previous owners' rusted-out pickup truck had to be towed away. "The garden has always been a work in progress," Hazel says. He initially called on Peter Annese of Columbus Stone Masonry to build just the back wall and a low side wall. But as the two collaborated on the project over the years, the garden has come to include a dozen foot-thick arches, a stepped front wall for holding potted plants, pedestals on which to stand various statues, a moon gate, and a herringbone-pattern patio with a peace sign and a yin-yang symbol set into it. And the stones of the wall, fitted together like the pieces of a kaleidoscopic puzzle, are not just your basic granite. "At the time, we were going through the New Age era," Hazel says, "so at the shop we were selling crystals brought up from South America. When I found something I liked, I'd say, 'Hey, Peter, put this in the wall.'" As the garden grew, so did Hazel's collection of outdoor sculptures and metalwork. Two magnificent statues, made from recycled metal by San Francisco artist Pierre Riche, stand sentry on tall stone pedestals; Hazel calls them the wizard and the griffin. A huge jeweled snake hugs a flower bed before climbing up the front of the house. Many sculptures reflect Hazel's interest in far-flung places: crouching figures from Guatemala, tall, thin headhunter statues from Borneo, Buddhas and Ganeshes from Nepal, Thailand, and India. Elizabeth Gehrman is a freelance writer in Boston. Send comments to magazine@globe.com.